This jumbo toilet paper is ideal for use in high traffic restrooms. The jumbo rolls allow for fewer run-outs saving on maintenance time and money. It is safe for all septic systems and has a universal 3.35" core. 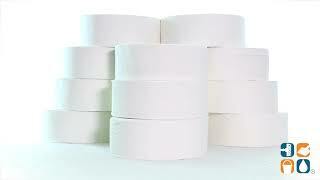 Each 2-ply roll has a 9 inch diameter and is 1,000 feet in length. White. Includes 12 rolls. Order yours today. Stock up and save even more! Call today!